It has been another year plagued by privacy scandals for Silicon Valley. In the midst of the controversies, Apple has managed to stay relatively clean. However, CEO Tim Cook has been outspoken in his condemnation of surveillance practices and rampant data collection. In an interview with Axios on HBO, Cook said that regulation in the tech industry is now 'inevitable'. Although the Apple CEO might have refrained from naming names, his recent comments are mostly directed at Facebook. It's the latest of his many thinly-veiled criticisms aimed at the social media network. They're not unwarranted, however. Facebook's shady political maneuvers were exposed last week in a damning New York Times report. The company used a PR firm - Definers Public Affairs, to smear critics and shift attention to other tech giants, including Apple. 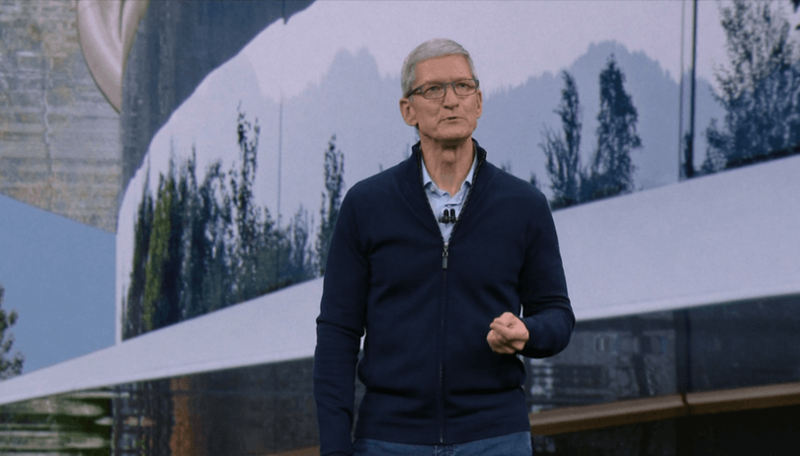 According to the Financial Times, it was reported that "A Definers’ affiliate called NTK Network posted dozens of articles blasting Apple and Google for “unsavoury business practices”, including calling Mr Cook hypocritical for criticising Facebook over privacy". Tim Cook is not hypocritical. During his Axios interview, however, Tim Cook admitted he was not a "big fan of regulation" and that despite his belief in the free market, it just doesn't work. Cook also said that in regards to technology "Many times it's not that the creator set out to do evil, it's that there wasn't an anticipation of these negative things it could be used for." Rather than hypocritical, these statements are in-line with his previous calls for an American version of the European General Data Protection Regulation (GDPR). Yet, when questioned about Apple's relationship with Google - a tech giant with its fair share of privacy scandals, Cook skirted the question. Apple currently accepts billions from Google every year to keep the search engine as the default on Apple products. Why? The CEO claims that it's because their search engine "is the best". Google spies on your location 340 times a day: and Apple? Cook also explained that Safari has options to protect the user's privacy no matter what search engine they use: "Look at what we've done with the controls we've built in. We have private web browsing. We have an intelligent tracker prevention. What we've tried to do is come up with ways to help our users through their course of the day. It's not a perfect thing. I'd be the very first person to say that. But it goes a long way to helping." Finally, the Apple CEO concluded that the choice between privacy and innovation is a false one. One can only hope that more companies adopt this slogan. What do you think? Is Tim Cook a hypocrite for still working with Google? Does Apple truly care about user privacy? Let us know in the comments. I'm thinking of switching to iOS. Most of the big boys, like Apple, are applying Europe's GDPR and associated regs globally anyway, and aren't expecting anything so much from what remains of the once UnitedSA. If anything the industry wants some governmental constraints on regional rules disparities being exploited by smaller players, and a few global thugs (like, apparently, Facebook). There's bit of journalism to be done on which companies are already voluntarily applying EU best practices worldwide, and which are not.